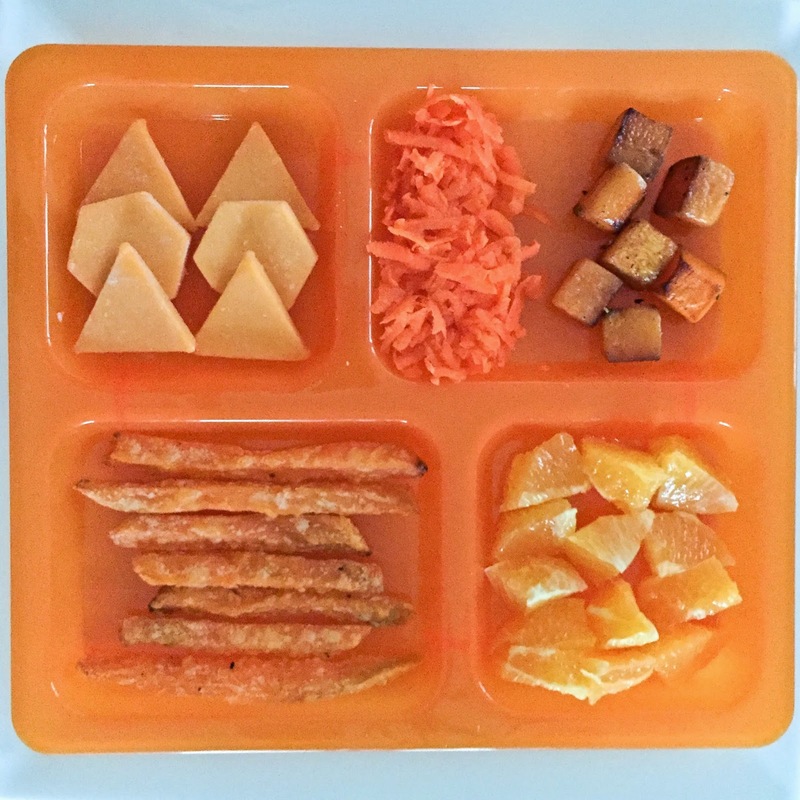 Following the rainbow (ROYGBIV), next up after Red Week came ORANGE week for Sweet P. We followed the same structure of our red week, involving an orange discovery box, orange foods, orange clothes, and an orange craft. 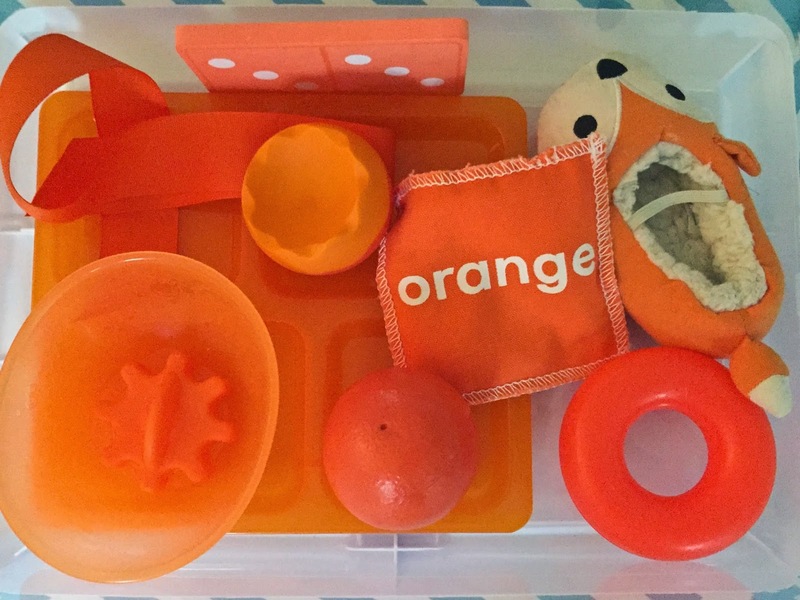 For the orange discovery box, I once again just scoured the house for anything orange. There were so many orange foods to choose from! 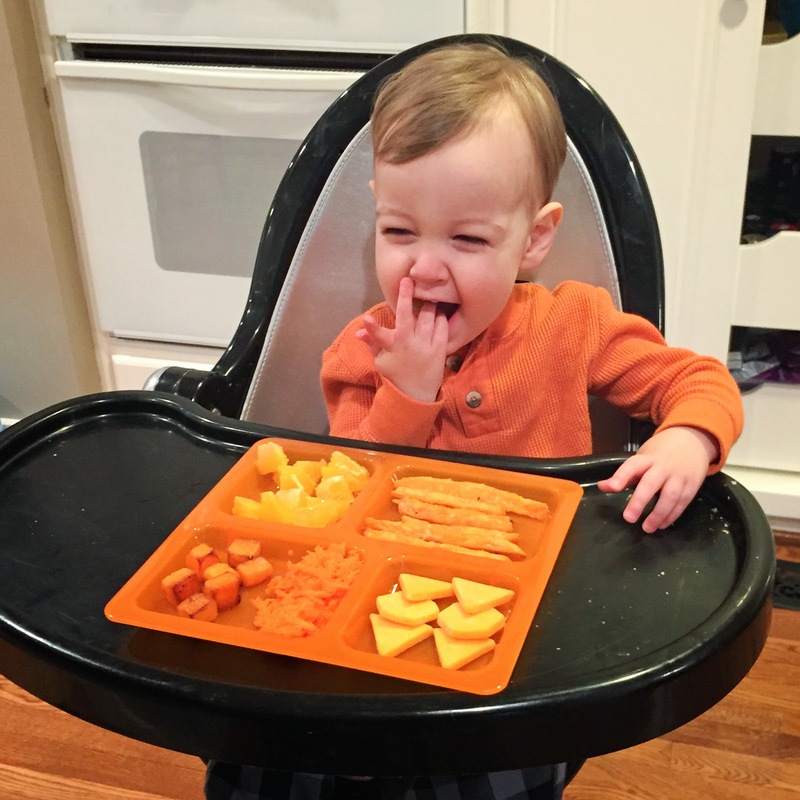 Clockwise we have cheddar cheese shapes, shredded carrot, roasted butternut squash, orange chunks, and sweet potato fries. 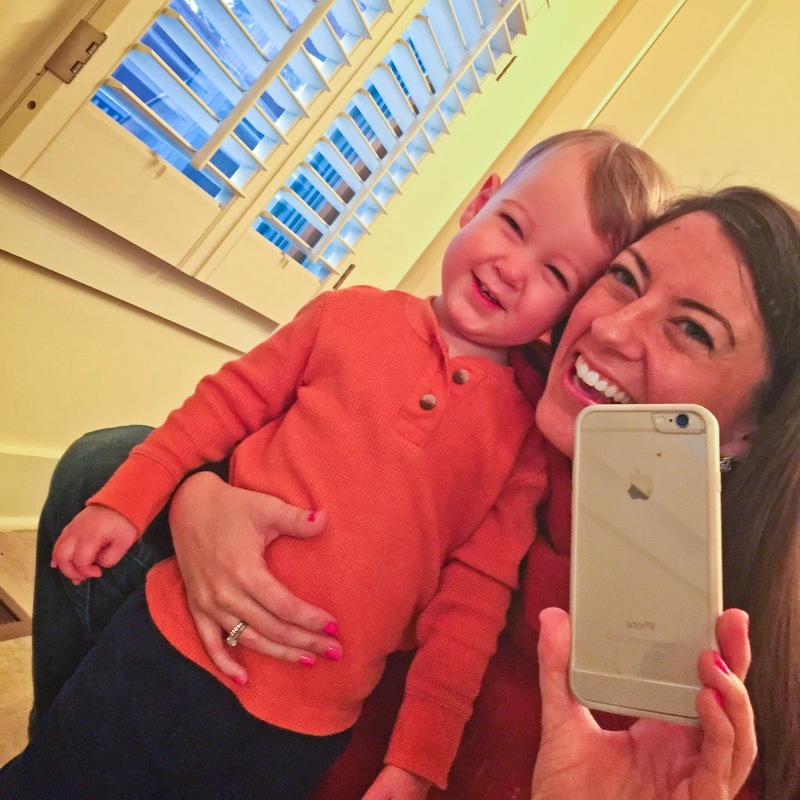 Y'all, I thought little man was going to turn orange himself. 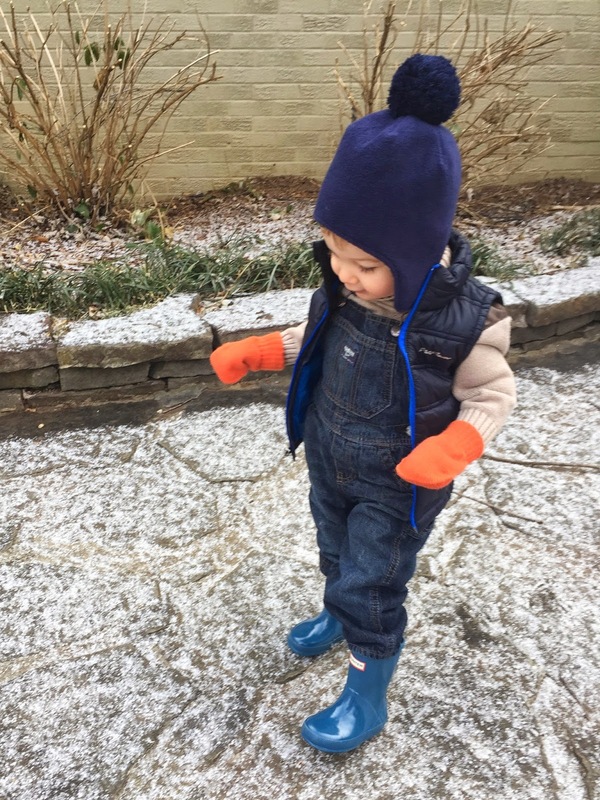 Orange mittens for playing in the snow. 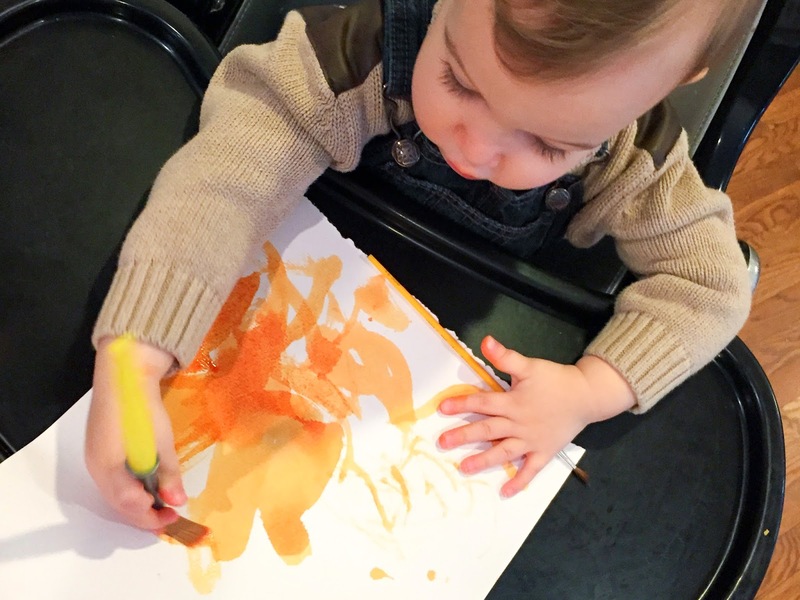 For the orange craft, Parker experimented with orange watercolor paint. First, I let him go to town on a blank piece of paper. 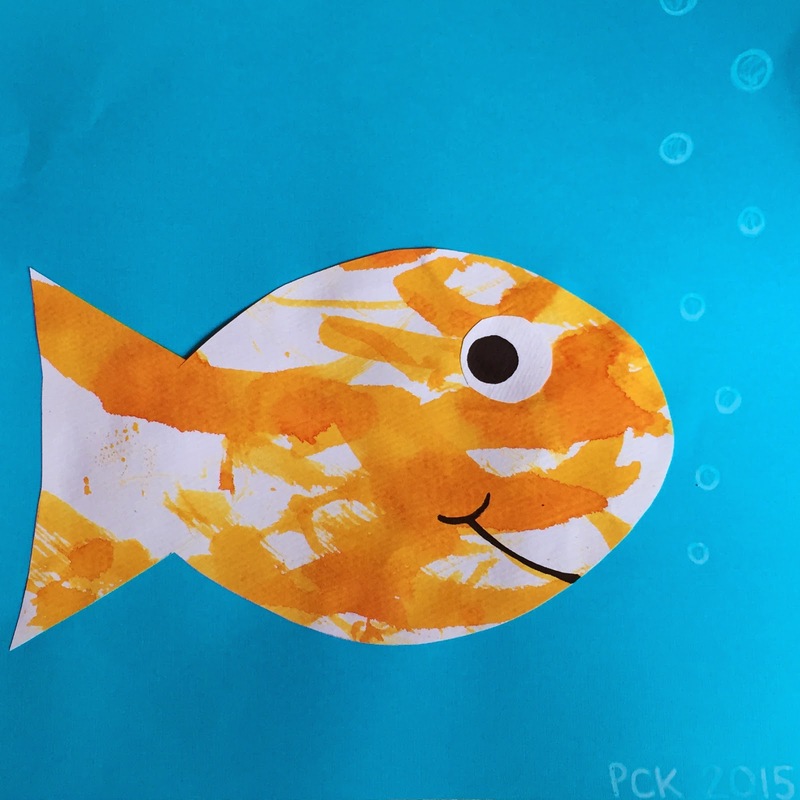 Then, I freehanded and cut out a fish shape on card stock (I just needed a shape that was orange), traced it on his watercolor page with pencil and cut it out. Parker helped me paste the other one on a piece of blue paper (then I added the mouth and paper eye). It has been amazing seeing Parker become more consistent and confident in his color identification! Orange (or, "Oooaaahrrrrr" as he calls it) was a color he really didn't know at all before, and he can point it out everywhere now! He continues to be strong with last week's color "gah" (red), and "boooo" (blue) even though we haven't studied that color yet, and he has somehow randomly picked up brown (I'm guessing Brown Bear, Brown Bear had something to do with it). He's also pretty good with purple, but yellow and green need the most work, which is perfect because those are our next two color studies! can I please tell you how much I love this idea!! 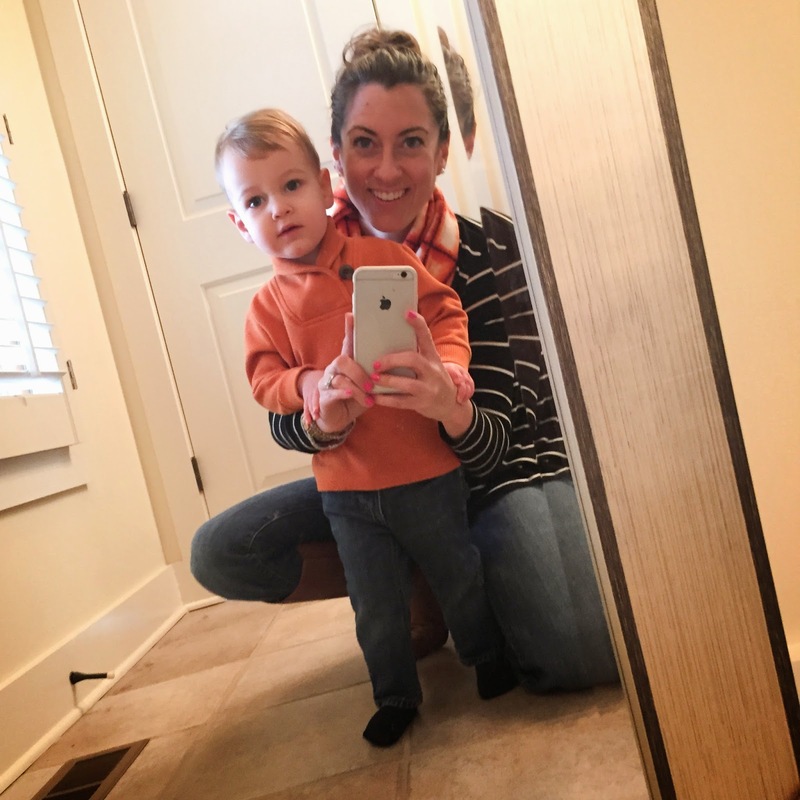 I need to get on it because I think it will be so great for not only Ellie but the 2 1/2 year olds I nanny every day!!!! Thank you so much for this great idea. About how many items are you putting in the box, how often do you get it out, and for how long does he play with it? Are the items you choose just random or are they more purposeful (texture/shape?) Thank you so much!! 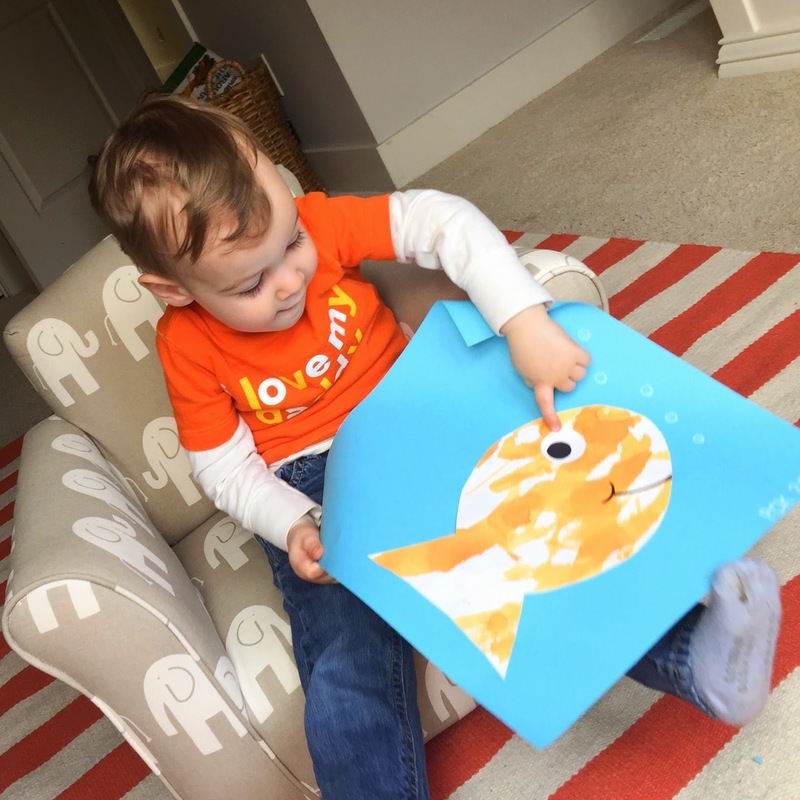 I think a post about how you make one and how he plays with it would be AWESOME for my Toddler Tuesday series...if your are interested in posting again! Hey Ashley! For the most part, what goes in the box is just whatever I can find around the house/playroom/kitchen wherever that is not messy (crayons, chalk, that's for craft time), and also not food (I just like to save food for meal times). Also, of course, safe and toddler friendly (for yellow week this week my husby wanted to put in his power drill, ha!). 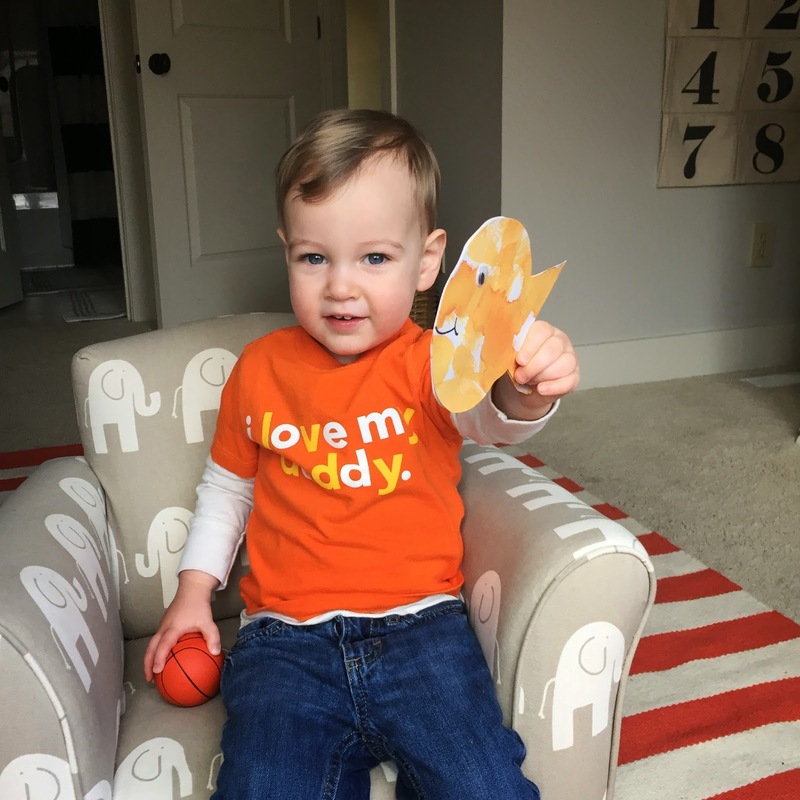 I usually end up with different shapes, textures and sizes so I'll talk about these if the conversation lends itself to it (but really, little man is most happy to find BALLS in the boxes that he can THROW!). If I want to stretch time out with the box I'll make another game like moving all the color pieces to another box across the room, or mixing in other items and sorting out the original color.